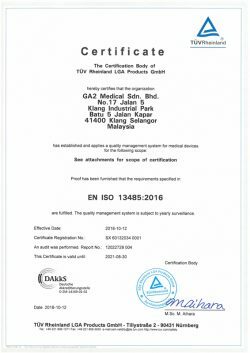 GA2 Medical is an ISO 13485:2016 certified and CE marked Medical Device manufacturer located in Malaysia. With many years of combined experience in medical device and contract manufacturing, our team knows what it takes to produce quality products and deliver them on time – every time. We specialise in the manufacturing injection moulded plasticware medical devices for the Malaysian and International markets. Medical and healthcare companies look to GA2 Medical for our manufacturing services where our team can deliver value over doing manufacturing in-house. 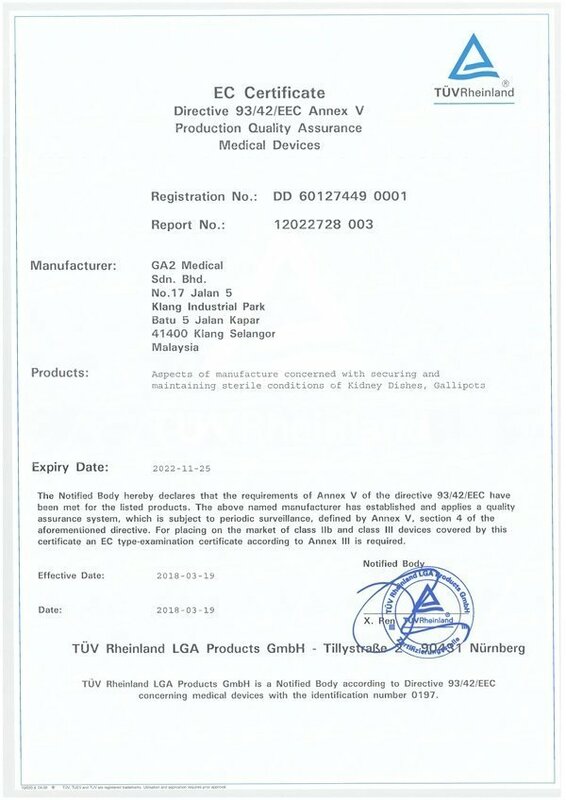 Companies who select GA2 Medical as their manufacturer, do so from the following reasons. Tell us what your product requirements are and one of our team will be in touch to discuss shortly. Simply fill in the form below, or get in touch by calling us on +60 (3) 3290 3442. Our people at GA2 Medical are central to our success. We are a collaboration of diverse thoughts, backgrounds, skills and life experiences. We are continually seeking motivated and skilled individuals who will thrive in a culture that encourages innovative thinking and share our values. In return, we offer career opportunities across our business with further training and mentoring with the attitude – we never stop learning. For us, our people are investments for the long term. A career with us is not just about the here and now. We’re committed to developing a diverse workforce, where your development is supported and encouraged through many opportunities. 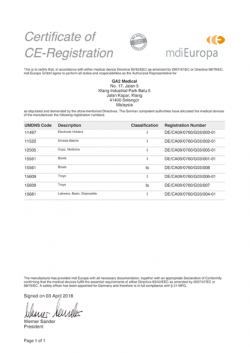 GA2 Medical is registered with the Malaysian Ministry of International Trade and Industry (MITI). This provides our products to be exported to other participating free trade countries with cost savings by eliminating or reducing customs duties. These agreements also address other barriers to trade, facilitating customs procedures and simplifying administration between trading partners. Malaysia is also a member of the Association of Southeast Asian Nations (ASEAN) Free Trade Area (AFTA). This is a political and economic organisation aimed to provide a competitive edge as a production base into the world markets through the elimination, within ASEAN, of tariffs and non-tariff barriers. These countries include Brunei, Indonesia, Malaysia, Philippines, Singapore,Thailand, Vietnam, Laos, Myanmar and Cambodia. 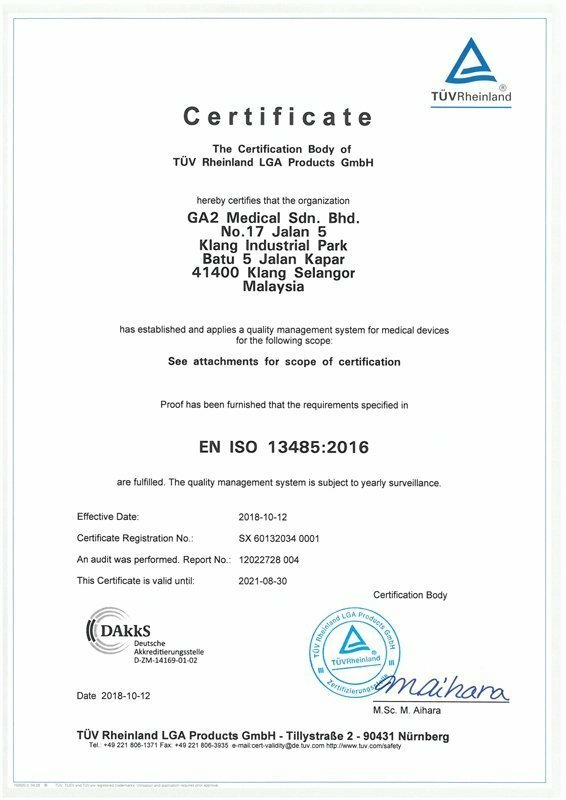 GA2 Medical is an ISO 13485:2016 certified and CE marked Medical Device manufacturer, located in Malaysia. We specialise in the manufacturing injection moulded medical devices for the Malaysian and International markets. Whether you have an initial design idea or concept, or are looking for an experienced and competent manufacturer of your product, we can confidentially assist you with product design, development, manufacturing and sales through to distribution. Since the day we started, our 6-Point Promise here at GA2 Medical drives every facet of our business, and it drives the promises that we assure each and every client. Unlike many other similar businesses in our industry, our 6-Point Promise is not merely marketing content, but our clear promise that we uphold on the inside and outside of our business. GA2 Medical is a manufacturer of medical plasticware products which include bowls, trays, kidney dishes, medicine cups and other polymer hollowware products in both single patient use and reusable forms. We also provide OEM manufacturing for local and international customers. GA2 Medical’s manufacturing facility is located in Klang – approximately 1 hour drive from Malaysia’s capital city, Kuala Lumpur. Located within close proximity, Port Klang is our sea shipping gateway and Kuala Lumpur International Airport (KLIA) providing air freight services. Since its inception in 2013, GA2 Medical has enjoyed significant growth in its product range and customer base, with continual expansion both locally and internationally. 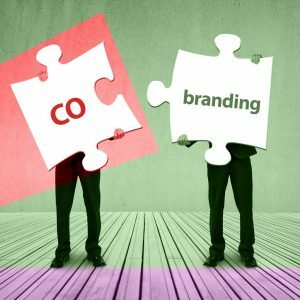 At GA2 Medical we truly understand the role partnerships play in driving innovation and the fulfilment of corporate social responsibilities. 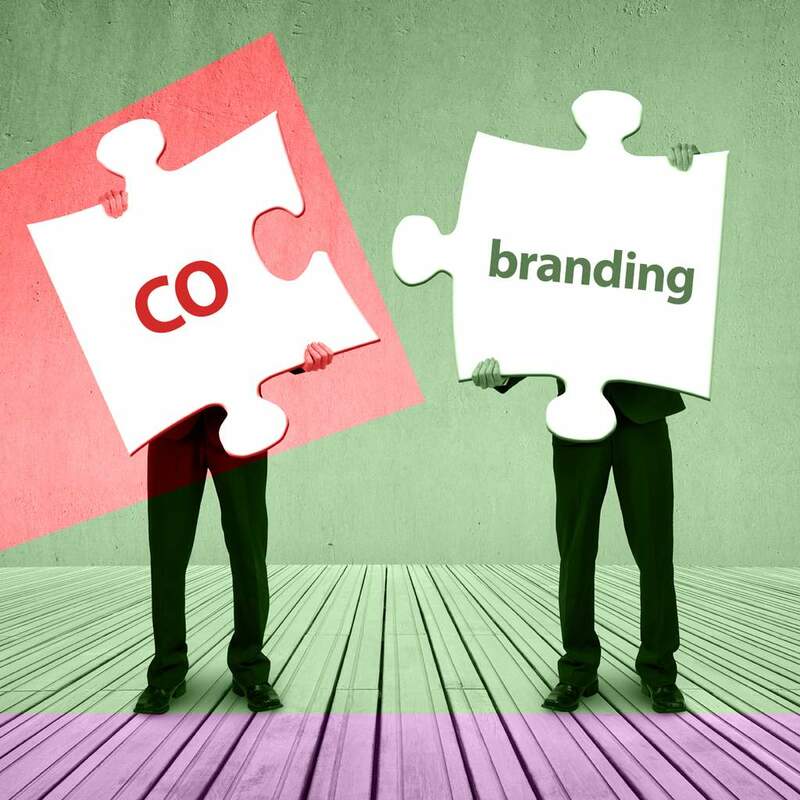 It is our extensive set of supplier and customer partnerships that keep our organisation educated and up-to-date with market trends, medical, scientific and technological advancements. We embrace the changing healthcare environment and seek to identify and explore opportunities as they emerge. With the best patient care always in mind, we insist on the utmost in quality of products, character of employees, and relationships with customers, suppliers and colleagues. We commit to strengthening our position as a market leader and a financially viable company through innovation and continuous improvement. To be a Company that truly lives by its motto: PERFORMANCE. BEYOND. EXPECTATIONS. We define our Performance to include profitability, sustainability, value, accountability, cooperation, functionality, engaging in and maintaining relationships with key stake holders, professional management and quality of product and service delivery. GA2 Medical aspires to be recognized by customers as a first-choice, world class medical device manufacturer, through the provision of the best products and customer service. 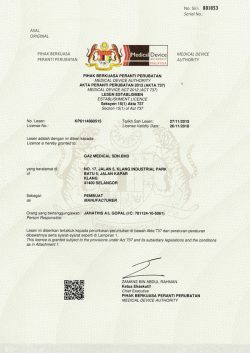 GA2 Medical Sdn Bhd is a manufacturer and distributor of single patient use and reusable plastic hollowware products, servicing local and international customers. 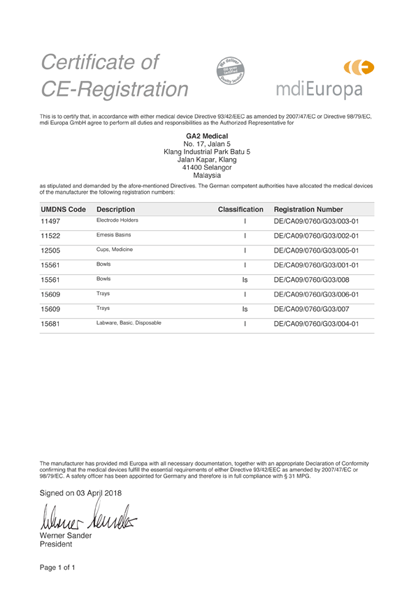 GA2 Medical Sdn Bhd is proudly ISO 13485 certified and is a CE Marked approved manufacturer. Our products have been recognised for outstanding quality, competitive pricing and exceeding customer expectations. We have, and continue to develop strong long-lasting relationships with many of the world’s largest medical device companies, as well as smaller but equally important partners in the MENA region, Europe, Asia and South America. We are a Malaysian company with strong Australian ties. We hold a strong business ethos based on Australian business values, practices and ethics – with the advantage of Malaysian manufacturing benefits due to its location and cost savings. We are proud to instil a ‘can-do’ attitude and adopt a proactive approach to all business facets. We are always striving for continuous improvement of manufacturing techniques and customer service, allowing us to keep our costs down and helps us to maintain an advantage in the marketplace. We are dedicated to stringent quality control of all aspects of the manufacturing activities. Efficient production methods utilizing top quality materials and components are to be used with no compromise. We will offer prompt and comprehensive pre-and after-sale service for all products to all customers. Training and motivation of all personnel ensures successful company operation and business philosophy uptake. Integrity. All activities will be conducted honestly and ethically. Respect. GA2 Medical recognises the value of all stakeholders, employees, customers and suppliers. Teamwork. The company encourages each employee to be a team player. Knowledge.The company strives to keep updated with the latest relevant legal, corporate, customer or other obligations, standards and technology to which the organisation subscribes. Service Excellence. The company seeks to provide the best possible customer service. Continuous Improvement. The company is committed to meeting the requirements of all interested parties by continually improving its effectiveness to ensure its suitability and appropriateness. Our Quality Policy is reviewed regularly to ensure it remains appropriate to the purpose, scale, nature and impact of the organization’s operational activities and services. 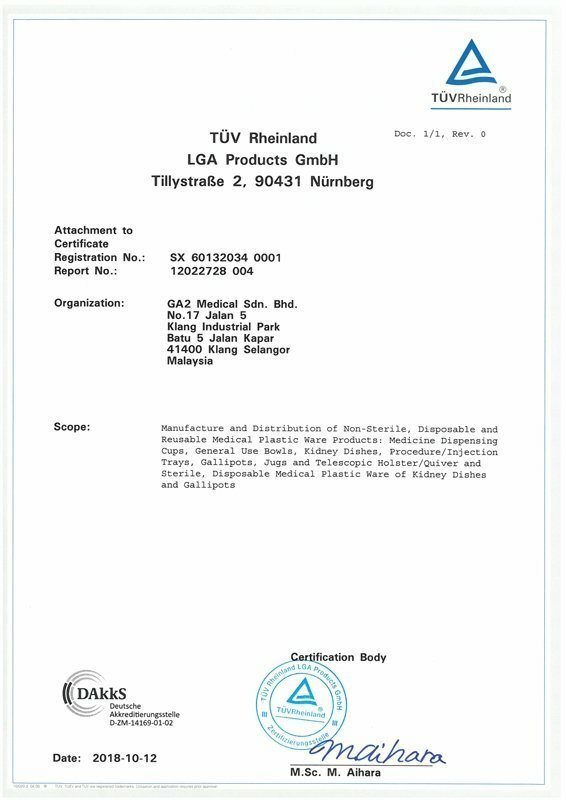 Our products are quality assured and CE marked allowing for free movement and sale across the European Economic Area through successful compliance to ISO 13485:2012 Quality Management System for Medical Devices, by internationally recognised Notified Body TÜV Rheinland. 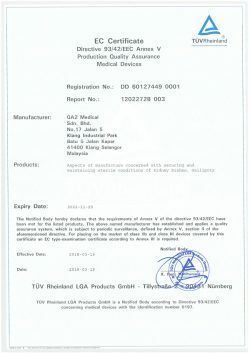 We are registered with Malaysia’s Medical Device Authority for both our products and business establishment. 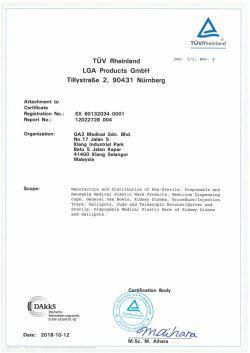 All processes and materials used in the manufacturing of GA2 Medical products meet both local and international standards. Establish and maintain a quality management system in accordance with EN ISO 13485:2012. Set objectives and measurable targets so that quality performance can be measured and continually improved. Provide adequate resources to achieve the objectives and targets of our quality system. Foster a quality culture with the aim of minimising undesired effects in our products. Encourage participation and promotion of quality culture in our employees through training, education, coaching and effective communication. Comply with all relevant laws and regulations, as well as internal requirements. Maintain a quality policy that is appropriate to the context of the organisation and supports its strategic direction. The company is determined to continuously upgrade their management and technical capabilities in order to stay competitive at all times. Our products have been designed to offer solutions to a variety of patient, staff and environmental problems that challenge the healthcare industry, particularly in regards to cost, safety and infection control. Despite being uncomplicated products, they are used in substantial quantities throughout hospital wards, operating theatres, day surgeries, nursing and respite facilities, GP and dental clinics, pharmacies, laboratories, and other healthcare facilities every day, in every corner of the globe. Significantly, they commonly compliment other capital, consumable and surgical products and equipment sold into and used within these facility types. Additionally, GA2 Medical products are well suited for inclusion into custom procedure packs and kits. We currently serve many multinational companies in this regard.